MARY LOU is Leader of Sinn Féin and Teachta Dála for the Dublin Central constituency. Mary Lou is married to Martin and they have two young children, Iseult and Gerard. She is proud to represent the people of Dublin Central where she has a reputation for hard work and championing the needs of her constituency both locally and nationally. 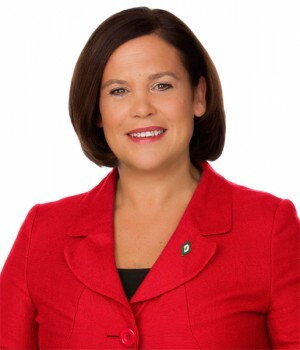 Prior to becoming Leader of Sinn Féin in February 2018 Mary Lou was Deputy Leader of the party. Following her election to the Dáil in 2011 Mary Lou was Sinn Féin’s Spokesperson for Public Expenditure and Reform and on her re-election in 2016 Sinn Féin’s All-Ireland Spokesperson for Mental Health and Suicide Prevention. She was a prominent member of the Public Accounts Committee between 2011 and 2017 holding Ministers and senior civil servants to account. She has also served on the Joint Oireachtas Committees for Public Expenditure and Reform and the Future of Mental Health. She was an MEP for Dublin from 2004 to 2009 and during her time in the European Parliament Mary Lou was a prominent member of the Employment and Social Affairs committee and Civil Liberties committee. Educated in Trinity College, Dublin, the University of Limerick and Dublin City University she studied English Literature, European Integration Studies and Human Resource Management. She previously worked as a consultant for the Irish Productivity Centre, a researcher for the Institute of European Affairs and a trainer in the trade union sponsored Partnership Unit of the Educational and Training Services Trust.